Someday we will actually get Summer weather here. Is it just here that has had extremely strange weather? I know I brought this up before but man, it’s freaky! Kentucky in June should NOT have rain and temps in the low 70’s. We should be sweltering even with the A/C on and lying buck naked in swimming pools while drinking fun drinks…. ummm, not public pools, people. And no, not me. I don’t want to scar psyches for life. BUT…! I’m preparing for Summer. I’ve mentioned before that I’m not a huge alcohol person. Been there, done that in my younger wilder days. But I do like some softer hard drinks. Honest, that really does make sense. That means I’ll drink a wine cooler type thing or regular wine. Sometimes I even have the hard stuff but not often because I end up a giggling fool within two sips. With the softer stuff, it takes at least 4 sips. 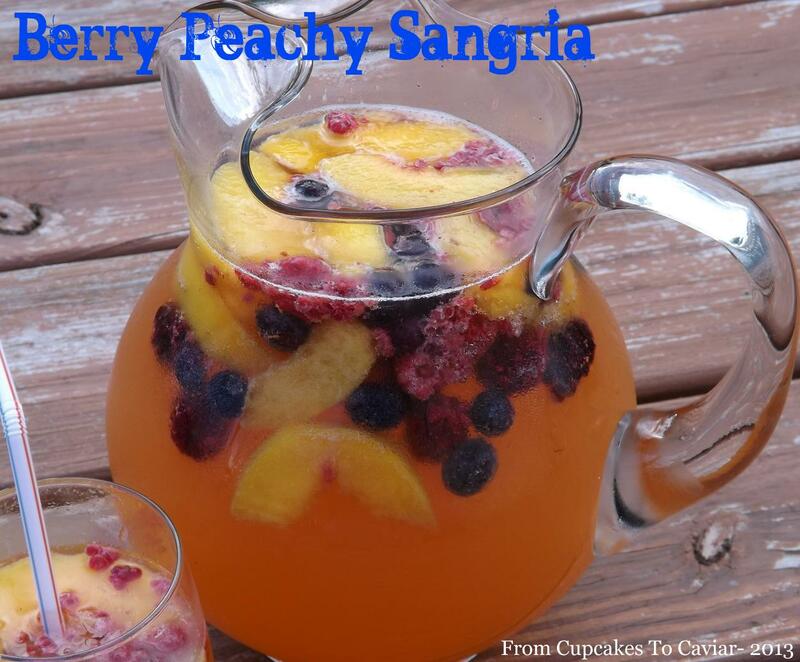 One thing I love is Sangria. I remember drinking the bottled cheap stuff in my younger days and it was even pretty good. But I decided I wanted to play with something homemade and made with white wine rather than red. This took about 90 seconds to throw together and I’m kind of proud of it since it DID take 90 seconds and it was all done on a whim. The Peach Schnapps adds a bit of bite but you can’t taste it as alcohol per se just a peachy flavor so be careful. Then the sweet sparkling wine and the Sprite and the fruit… well, suffice it to say that this comes together nicely. It can pack a punch though if you’re not a drinker so like I said, be ready. This has a full bottle of wine plus a cup of schnapps but all you taste is a wonderful peach taste. You know the drill. Get to cookin’…erhmmm, pouring. Drop your frozen fruit down into the bottom of your pitcher. 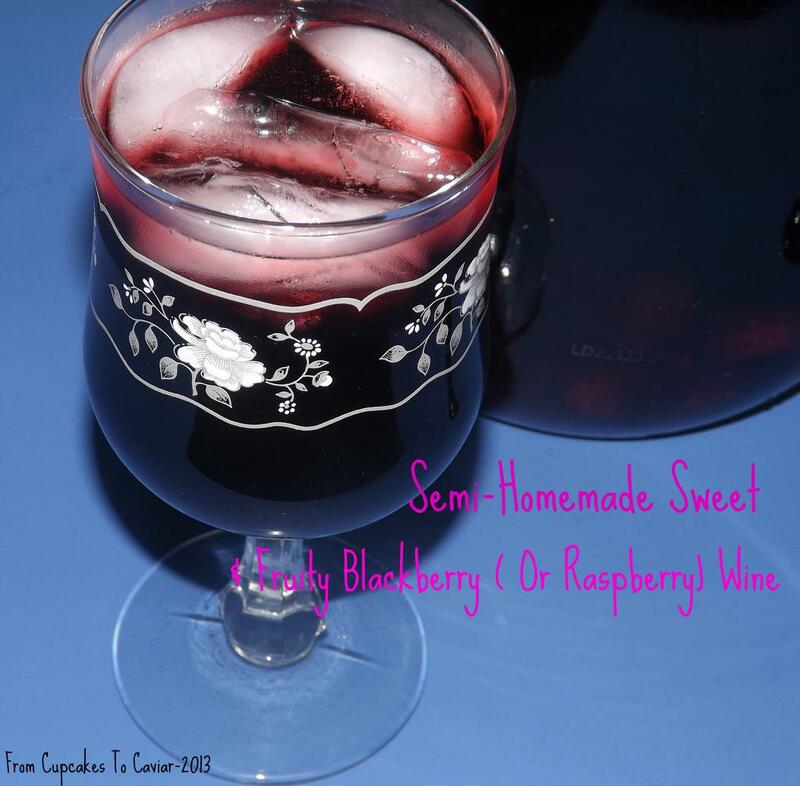 Pour the peach nectar over, then the schnapps, Then slowly pour in the wine and follow up with the soda. Give it all a gentle stir. You can serve immediately or refrigerate it to let the flavors blend. I suggest letting it sit. 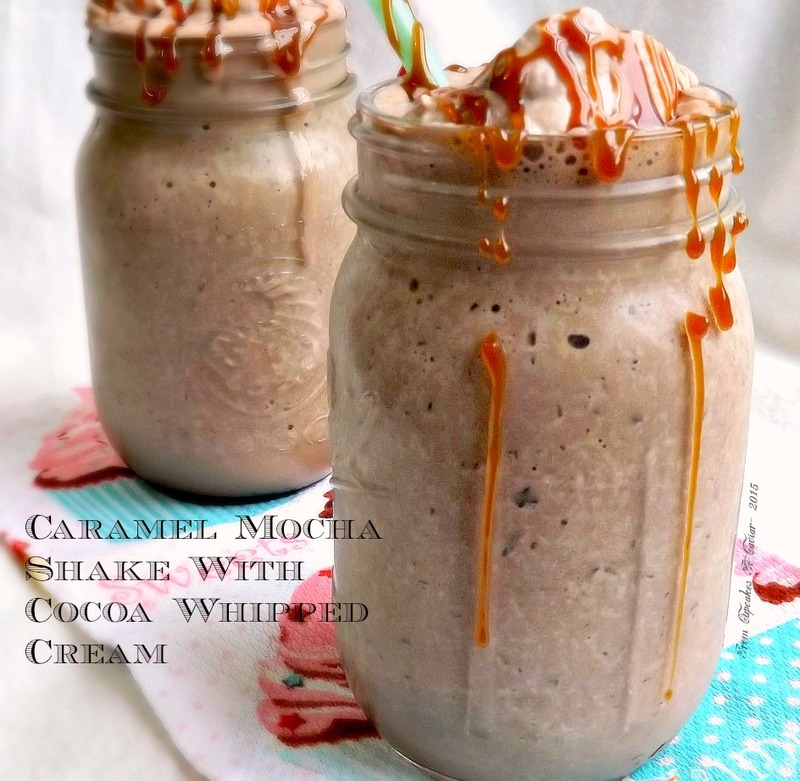 It was good right after being made but it was outstanding an hour later when it blended. See how easy that was? I just added this direction because I felt stupid only having one direction up. Who Says This Flavor Combo Is Just For Christmas? I think it has already become obvious that I like drinks. No no not alcoholic drinks though I have been known to imbibe at times. On a side note related to that, the women my husband works with (he is an R.N. so mainly works with women) told him recently when I was talking to him at work and said for him to tell them that I would have a beer for them (they were working late) that I “didn’t look like a drinker”. Huh? Now I love these ladies to death so if you’re reading this, know that it tickled me to no end to hear that but…. HUH???? What does a drinker look like anyway? 😛 I feel like next time I want to have a drink (tonight) I need to get on a wife beater t-shirt, lots of eye make up and burp and cuss a lot. Wait… I know people like that. Never mind. 😀 But seriously, what does a drinker look like anyway? Obviously not middle aged and middle income with long hair that has more gray than I like to admit to and a really laid back way of dressing (translate- jeans and t shirts or nightgowns if I can get away with it). I have always gotten the “sweet” label but darn it, I can cuss and drink with the best of them!!! So long as they don’t say anything stronger than darn it and don’t drink anything too high of a proof or I’ll end up on the floor…or giggling madly because my hand looks funny. I’m really ruining my own case here aren’t I? Sigh. Moving on…or back…or sideways, whichever it was, I like drinks. Cold drinks, hot drinks, warm drinks, room temp drinks (am I the only one who prefers my pop room temp?). I am a very poor eater at the best of times but I am a fairly big drinker (now that sounds bad. I can see it later… “Yeah Janet said right there in her blog that she has a drinking problem! No, really, she did! She said she is a big drinker!”) and like most people, I am even more so in hot weather. I still drink my hot tea but I like to shake it up a bit. Hmmm, now that I’ve said shake, I can move onto the recipe. Wow, was that a lame segue or what!? I have never been much on the you can/should/must/it’s the law/only eat some things during certain times of the year idea. 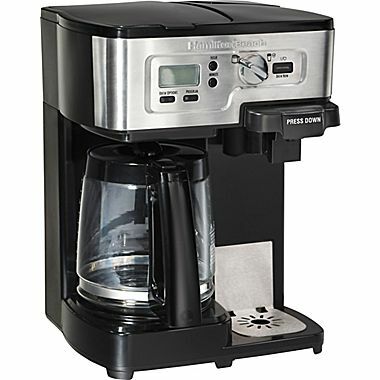 When I want something, other than seasonal berries that cost more than a house payment during the Winter, I want it now. I don’t want to wait six months for it to be the “right” time to eat it. Today, I wanted chocolate mint. That is typically a combo one sees the most during the holidays and I’m not sure why. Especially when you can be having it in this delicious shake. And boy, do I mean delicious. Being the poor eater that I am, I will probably not eat dinner tonight because I am too busy slurping this shake down as I type this. But I think it’s worth it 😀 Frosty mint, vanilla ice cream and sweet chocolate . Oh my. This is yummy. 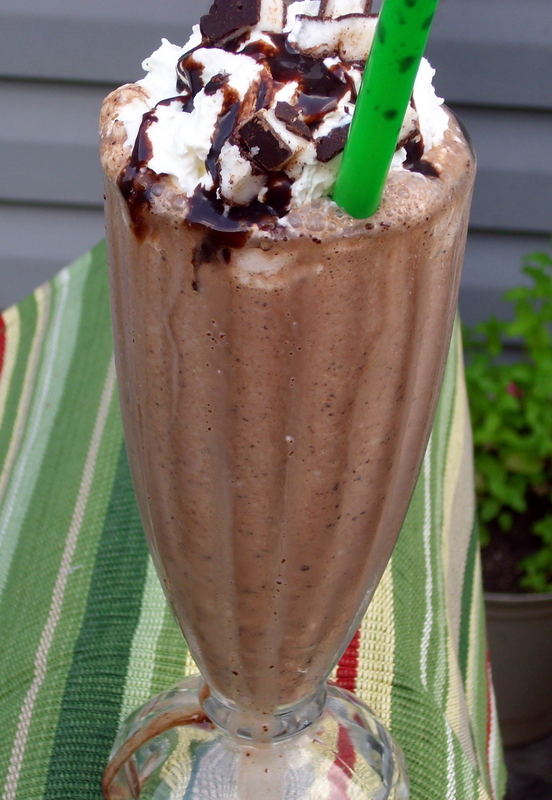 So get out the blender; go buy some York Peppermint Patties and vanilla ice cream (and some peppermint schnapps and creme de cacao if you want an adult version) and get to blending this one. Enjoy! I believe I may have mentioned once or twice or five thousand times that I am a tea fanatic. I am pretty peasant in my tastes too. Give me a nice black tea, maybe some orange pekoe and I’m set. That was my way of saying that yes, I use Lipton tea bags and love them. Tea doesn’t have to cost 20 dollars for an ounce of it to be good. I’m about as far from snooty as you can get about tea. Ok, that’s not true. I won’t drink store brand teas cause I haven’t found a good one yet and I won’t drink decaf tea because it tastes weird. If you’re a coffee drinker who thinks that of decaf coffee (which strangely enough, tastes fine to me) you can understand where I’m coming from there. I do however love variety teas. I enjoy some herbal teas. Celestial Seasonings makes some wonderful ones. 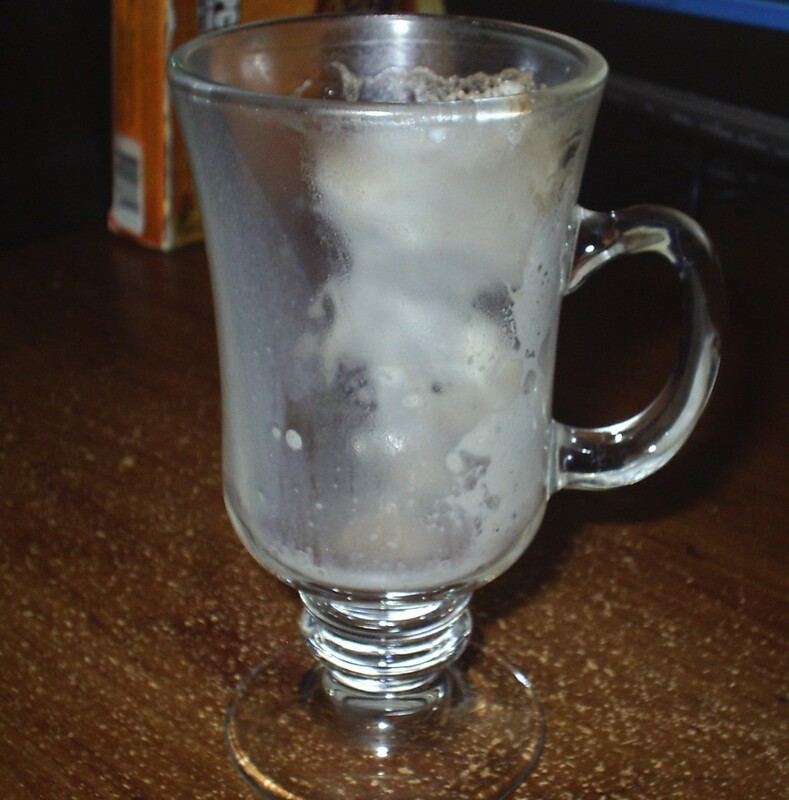 One of my favorites is the most soothing drink ever to have late at night. I love that stuff. 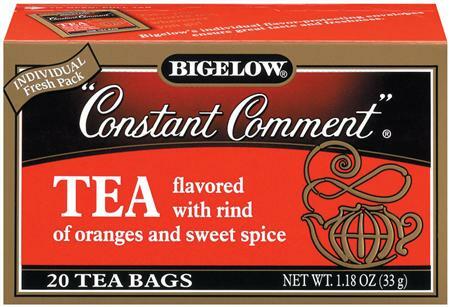 But one of my all time favorite teas is Constant Comment tea. It is a black tea that is flavored with orange rind, cinnamon and other spices. It is SO good. So one day a few years back, I wanted something cold. It was approximately 5000 degrees outside (the people of Mercury came here for a tropical vacation) and I was dying of heatstroke. But I still wanted tea. So I took my constant comment tea and made a batch then mixed it with some instant strawberry lemonade. Voila!! (Sorry, don’t know how to make the thingie that makes that word look official) I had a new and so yummy Summertime drink. It’s tart (you can make it sweeter with more drink mix) and refreshing. It’s also good hot in Winter btw. And it couldn’t be any simpler. So give this a try. 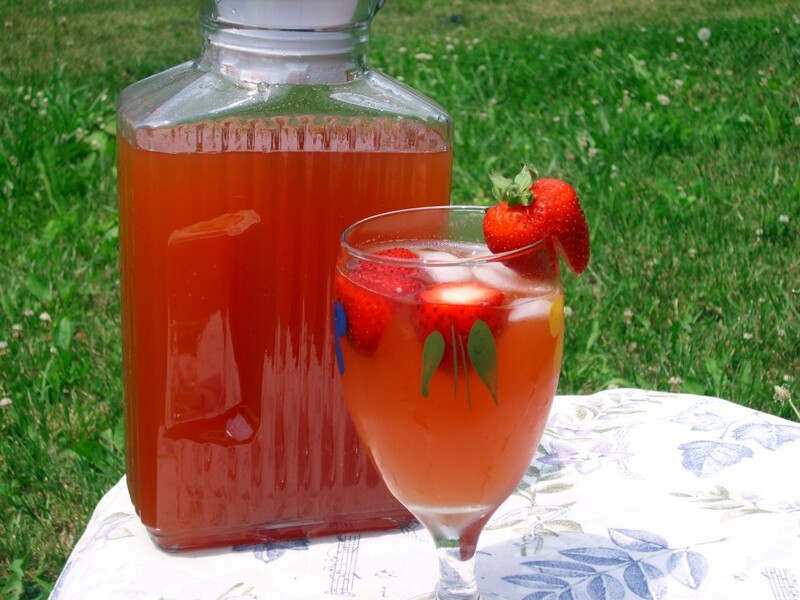 Make a batch, float some frozen Strawberries in it, get out a good book and sit down and relax while you sip this. Slurping allowed. But I wouldn’t suggest licking out the glass unless you’re alone. You’ll get some weird looks. In a medium bowl, microwave the tea bags and water for five minutes. Let steep at least one hour. Mix in the strawberry lemonade mix. Let cool. Add cold water and ice to make this equal a half gallon. Garnish with frozen strawberries. Drink. Slurp a lot. Mmmmm; chocolate and...well...chocolate. What more could I want? And that can take different forms. The best comfort in my life is God and my family. A hug from my kids or my husband can cure many an ill; most of them in fact. Making people laugh also comforts me. I have been a ham all my life and if I can get a laugh, even at my own expense, it makes my day. Sometimes, even though the “experts” tell us it’s wrong, food and drink can be a comfort. 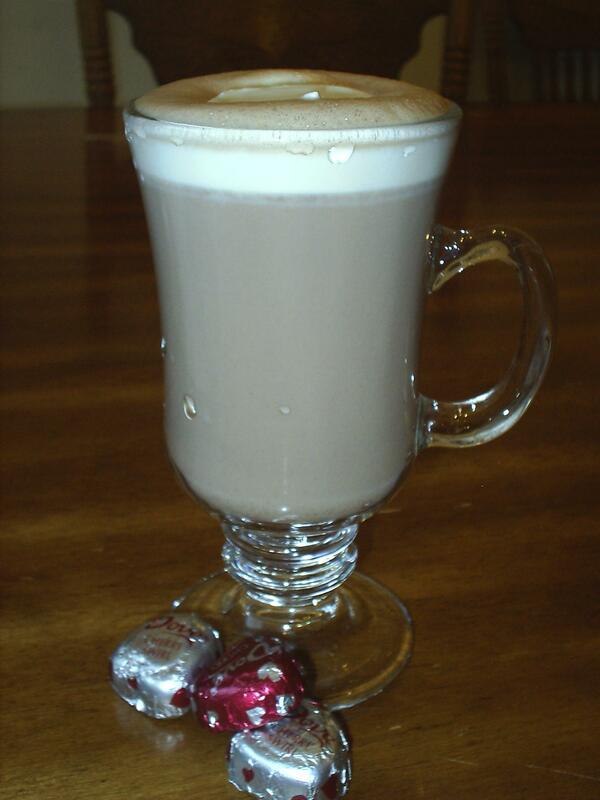 A nice warm soothing drink can make a bad day better. The chocolate flavor is mild in this. I didn’t want it to be overpowering. You could always add more chocolate if you want but it will drastically change the balance of flavors. Mix everything together in a large measuring cup or bowl. Microwave on high until hot. Stir well to melt the chocolate.